The leech is a segmented annelid worm that has a slightly flattened cylindrical body. The dorsal surface of the body is typically dark brown or black while the ventral belly is usually lighter in color and speckled. The head contains a disk-shaped sucker, which also contains the mouth. The leech uses it's sucker mouth to feed off of blood from a temporary host. When the leech feeds, it injects an an anaesthetic to prevent the host from feeling the pain of the bite and removing it. To ensure the host animal's blood doesn't clot while feeding, the leach also injects an anticoagulant. In order to view it's surrounding environment, the leech has 5 pairs of eyes. Leeches can be found in freshwater pools throughout the world and usually require a muddy bottom along with plant foliage. There are a few species of leaches that are terrestrial. Leeches are known to attach to humans in hopes of obtaining a blood meal but they are very rarely dangerous. 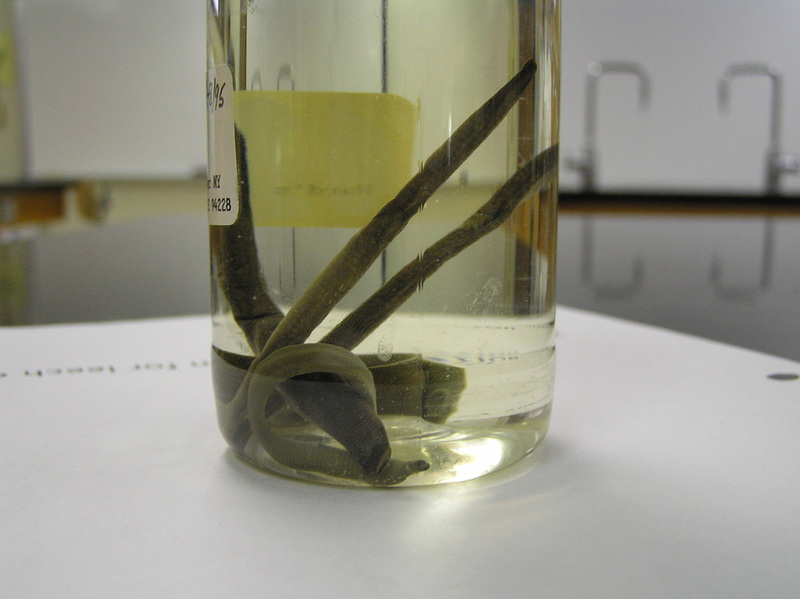 Medical leeches are still used around wounds to help remove dead tissue and bring blood to newly developing tissue. "Medical Leech (Hirudo medicinalis)". Arkive. Retrieved from: http://www.arkive.org/medicinal-leech/hirudo-medicinalis/.